Spray 5- to 6-quart slow cooker with cooking spray. In slow cooker, mix onion, chipotle chiles and 1/4 cup water. Using sharp knife, cut slits all over pork; insert garlic into slits. Sprinkle pork with salt and pepper. In 5-quart Dutch oven, heat oil over medium-high heat. Add pork; cook about 8 minutes, turning to brown all sides. Place pork in slow cooker. Pour 1/2 cup water into Dutch oven. Reduce heat to low; stir with wooden spoon, scraping pan to loosen brown particles. Pour liquid into slow cooker. Remove pork from slow cooker to cutting board; cool 10 minutes. Shred pork, using 2 forks. Return pork to slow cooker; mix well. 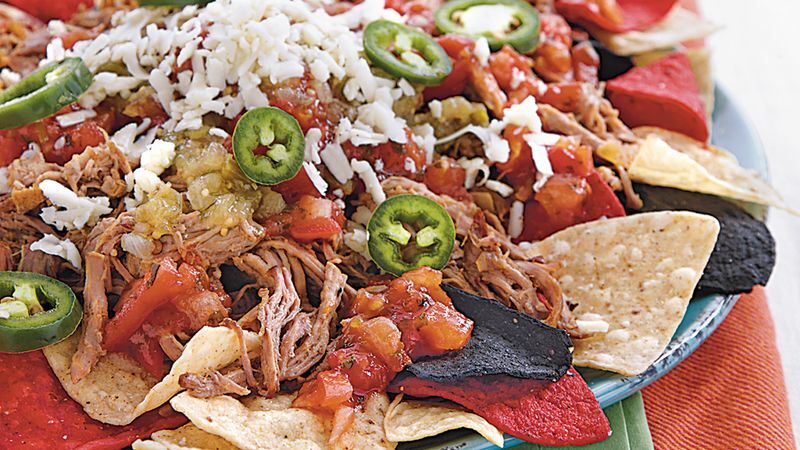 Serve pork over tortilla chips with desired toppings.